I learned something new. I learned how to run an auction. I watched how-to auctioneer videos, I watched Herzog's documentary on auctioneering, I practiced tongue-twisters and counting rhythms, and then, with the help of the CAKE crew and my glorious intern Emma Rand, I raised over $2,500 for the 2013 Chicago Alternative Comics Expo. What other fulfilling pursuits have I recently co-created with talented friends? Funny you should ask! The sophisticated and thoughtful duo Bonnie & Maude, AKA Kseniya Yarosh and Eleanor Kagan, were kind enough to invite me onto their femme-centric film podcast while I was visiting Brooklyn last month. We spent about an hour talking about the 1972 Bob Fosse film Cabaret. Cabaret is my favorite movie. If you want to hear me nerd out haaaard on this dark, queer musical, check out the episode. Lots of spoilers; but if you haven't seen it, maybe you should listen anyway so you can forget what you anticipate the film to be based on the fact that it's a musical (you're wrong). Look, I even kind of had the hair. 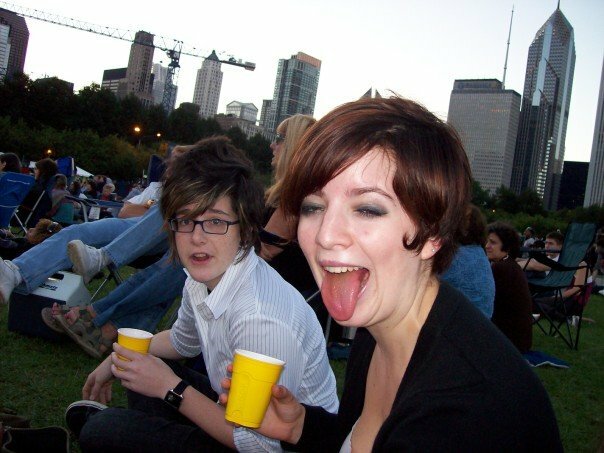 'Hilarious' photo courtesy of my freshman year at SAIC and the 2006 Chicago Jazz Fest. There is wine in those cups that I bought for my friends with my fake ID! Good old Lyra, always collaborating with talented friends. An extraordinary feat of engineering. A plane. A bridge. A tower. A tightrope; its walker. A survey; its proctor. A suture; your doctor. An event: the twelfth in a series of performative comix readings. As well as live synthscapes by Tyson Torsentenson. Refreshments will be available including gf/vegan goods from local bakery D’ology. I designed this poster with Clay Hickson and printed it with Andrew Ghrist. Clay and I (who grew up in the same small town in northern California but didn't meet until both moving to Chicago for the same school, pretty neat huh) sat down and sketched the body of the plane together, then I inked it and drew the people, then Clay drew the squiggles and did all the airbrushing, then I finished the text. Clay has a ton of really beautiful airbrush and wiggle work over at his website, you should really check it out. The simplicity of this poster was a big relief after the insanity of the last one. Printing was a bit tricky, mostly mixing the colors, but they came out well. I've been putting out the Brain Frame newsletter for five months, now, and they're getting pretty fancy. This latest effort even matches the poster colors to the email borders, check it out. 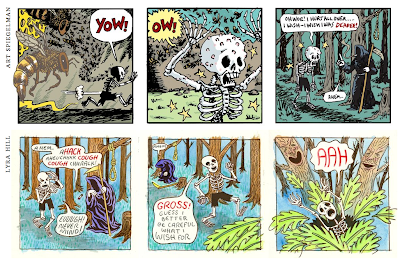 After my submission, you can follow the story either with a strip by John Porcellino or a strip by August Lipp. In the future, there may be more options. That's because the Infinite Corpse is just that - infinite. 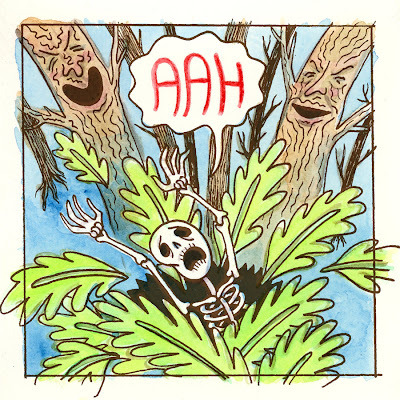 This is a project that Trubble Club (mostly Aaron Renier and Nate Beaty) have been working on for a full year. 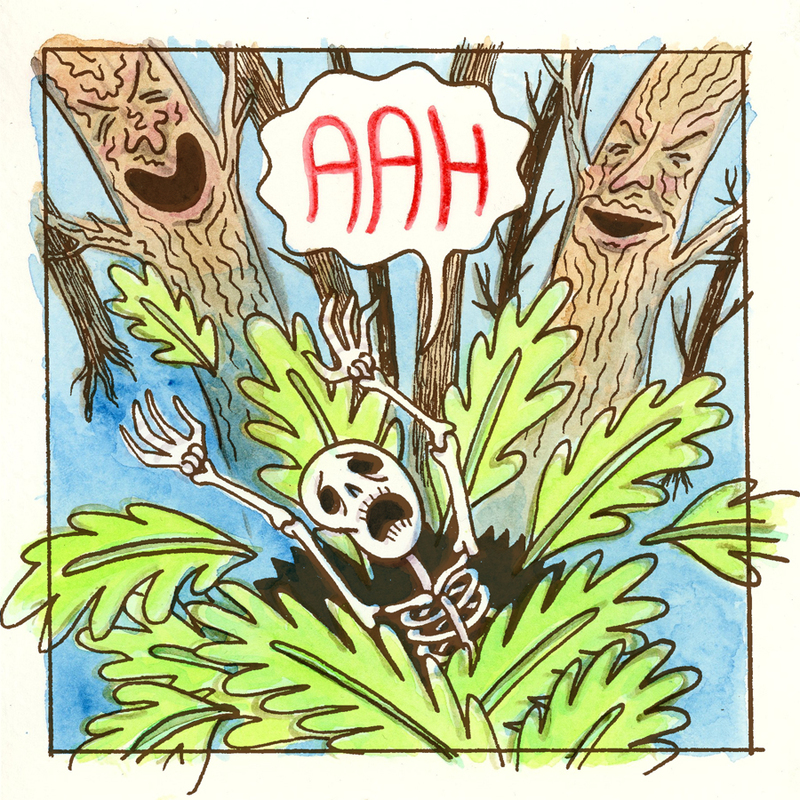 It's a chain comic that never ends, branches off in innumerable dimensions, and currently features the work of over 200 artists, growing daily. Anyone can contribute their follow-up to a random three-panel segment. Submissions are reviewed by a panel of Trubble Club members, but most of them get in, so go ahead! 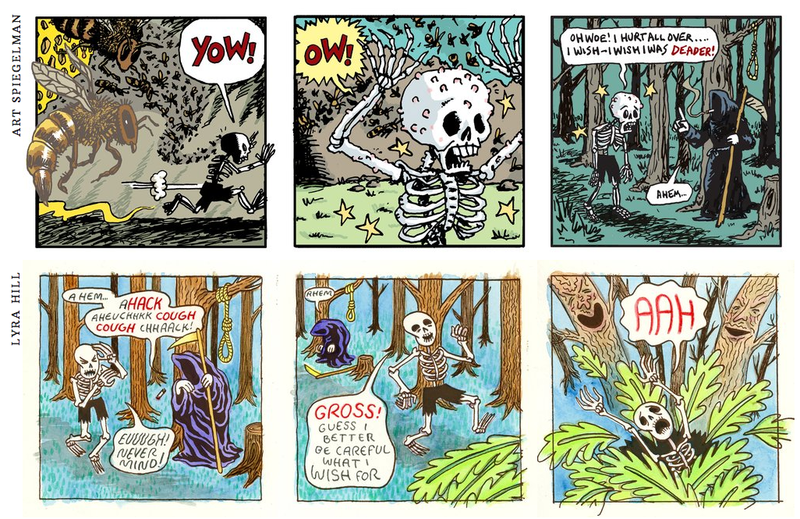 In the beginning, when Aaron was gathering the original strips that make up the framework of the Infinite Corpse, it was in true exquisite corpse fashion. I wasn't able to see any panels except the ones I was following. Now, with the catacombs online, artists will be able to build longer story arcs and reference other parts of the narrative (if they want). I am flabbergasted by the seamless genius of the Infinite Corpse. I can hardly believe I have such innovative and talented friends. Please, spread the word and contribute.